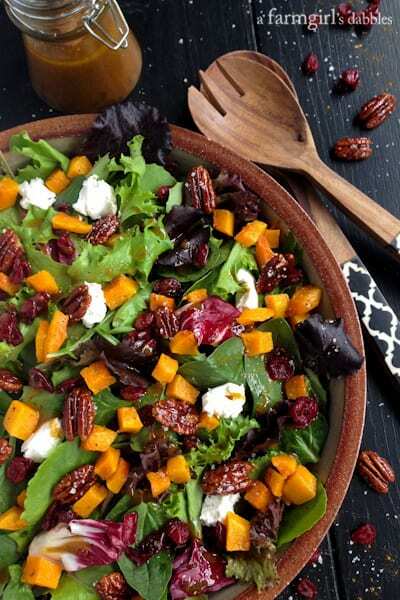 This Harvest Salad with Butternut Squash, Maple Pecans, and Curry Fig Vinaigrette is fresh and green and full of yummy bites of contrasting flavors and textures. We’re hosting Thanksgiving this year, only the second time that our family has taken on this feasting feat in our own home. Blake’s family is coming to stay with us for a few days, a visit that we’re all looking forward to. The past couple years have brought health challenges to my mother and father in-law, now in their 80’s. Shingles for Loree, a hip replacement for Archie. So they simply haven’t been up for the 4 hour drive to our home. But they’ve slowly sprung back, thankfully, and are ready to take on a road trip. We’re happily anticipating their arrival. So, as you can guess, I’ve been pouring over recipes new and old, trying to put together a Thanksgiving menu. I’m grateful that Blake always takes on the turkey outside with the grill or smoker. It’s one less dish that I need to babysit, plus it frees up precious oven space. We’ve all agreed that this grill-roasted turkey with red wine gravy is the recipe for the day. Blake made it once last year and it was wonderful! Other than that, all I’ve definitely decided on is green bean casserole (the only request from Blake), my chocolate French silk pie with salted pecan crust (SO GOOD! 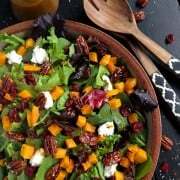 ), and this recipe I’m sharing with you today, Harvest Salad with Butternut Squash, Maple Pecans, and Curry Fig Vinaigrette. The salad is fresh and green and full of yummy bites of contrasting flavors and textures, perfect to grace our Thanksgiving table. 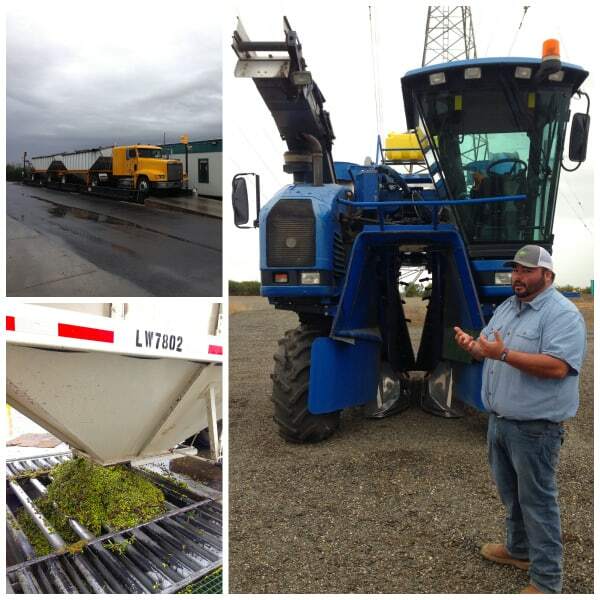 I took a quick trip to Sacramento recently, to visit California Olive Ranch. You can read more about it later in this post, after the recipe. We restaurant hopped around the city the first evening, enjoying a progressive dinner of dishes using a variety of California Olive Ranch oils. At the first stop, Block Butcher Bar, the charcuterie was the main event, absolutely wonderful. But it was the green salad that truly stole my heart. With its little cubes of sweet butternut squash, plus cranberries and goat cheese, I kept going back for more. That dish was the inspiration for this salad that will be on our Thanksgiving table this year. I roasted up a good size batch of butternut squash and put a container of it in the freezer, thinking this will spare me some time on Thanksgiving day. I’m also planning to make the curry fig vinaigrette a day or two in advance. It really doesn’t take much time to put together, but it’ll be one less thing to concern myself with that day. Plus, a day left to mingle in the fridge will allow the flavors to marry. 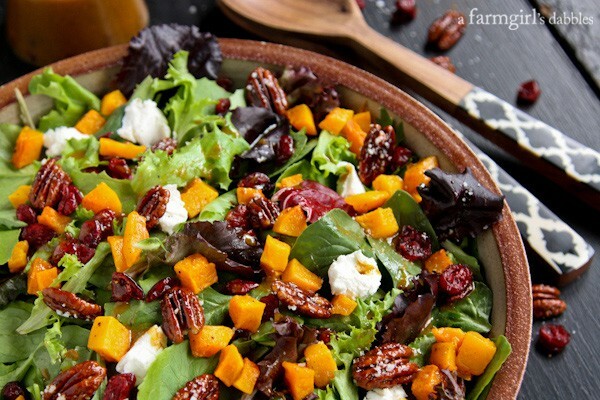 If you’re looking to save even more time in preparing this harvest salad with butternut squash, just pick up a bottle of Salad Girl’s Curry & Fig Salad Dressing. It’s my favorite bottled dressing, made from a company right here in Minnesota. A salad like this brings me so much joy. Just looking at it is pleasurable, so pretty. And I love the variety of flavors and textures. 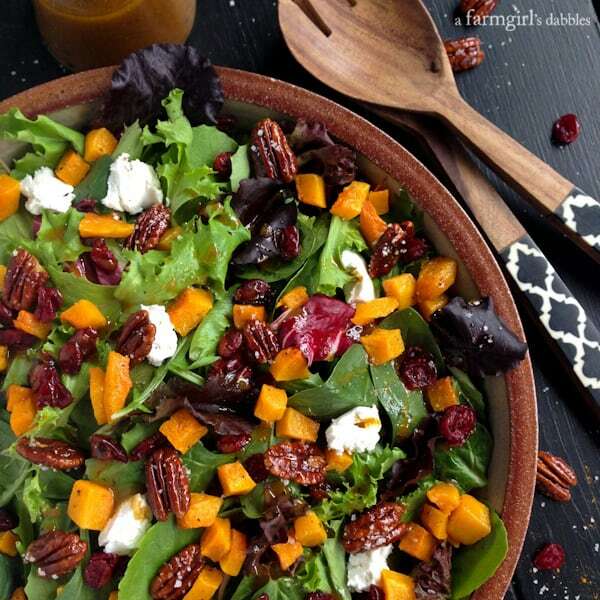 Fresh greens, sweet squash, tart and tangy cranberries, creamy luscious goat cheese, and maple pecans for a salt-sprinkled crunch. I used to buy candied pecans at the store, but I’ve come up with a super quick and delicious way to create them at home. They’re dangerous to have around, the perfect snitchable snack. I suggest you make a double batch to ensure you have enough for the salad! Preheat oven to 375°. 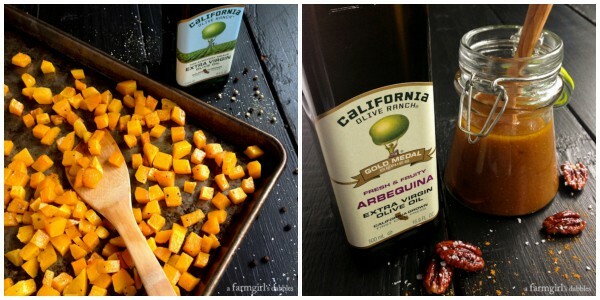 On a roasting pan, toss squash with olive oil to coat. Sprinkle with salt and pepper and toss again. Roast for 15 minutes. Stir. Roast for 15 minutes more and stir again. Roast an additional 10 minutes to caramelize the squash a bit. Remove from oven and let cool. This can be prepared the day prior to serving. Just place cooled roasted squash in a container and refrigerate until ready to use. In a nonstick skillet over medium to medium-high heat, toast the pecans for 3 to 5 minutes, or until warmed and fragrant. Drizzle maple syrup over pecans and stir to coat. Drizzle orange juice over pecans and stir to coat again. Spread pecans in an even layer in the skillet and cook for 2 minutes. Stir the pecans and cook for 2 minutes more. Remove pecans to a plate and immediately sprinkle with the sea salt. Separate the pecans and let cool completely. Leave pecans whole or chop them up a bit, if you like. These are best prepared the same day. If made the day prior, they will still be very good, but they won’t have the same super crisp outer snap. Whisk all ingredients until well combined. This can be prepared the day prior. Refrigerate until ready to use. Let come to room temperature before whisking to combine, and then drizzle over salad. Place half the greens in a large salad bowl. Drizzle with some of the vinaigrette and then sprinkle on half the squash, half the cranberries, and half the goat cheese, followed by a sprinkling of salt and pepper. Add the rest of the greens, followed by the remaining squash, cranberries, and goat cheese. Drizzle with more of the vinaigrette. Sprinkle with flaky sea salt and freshly ground black pepper. You could serve the vinaigrette on the side, instead of drizzling it on the salad, for individual servings. This would also help to preserve any leftover salad. Traveling opens up my world and fills it with new experiences and landscapes. I was so thankful to have a window seat on this flight to Sacramento. The skies were clear most of the way, letting me see the rise and fall of mountains as I traveled from Minnesota to California. 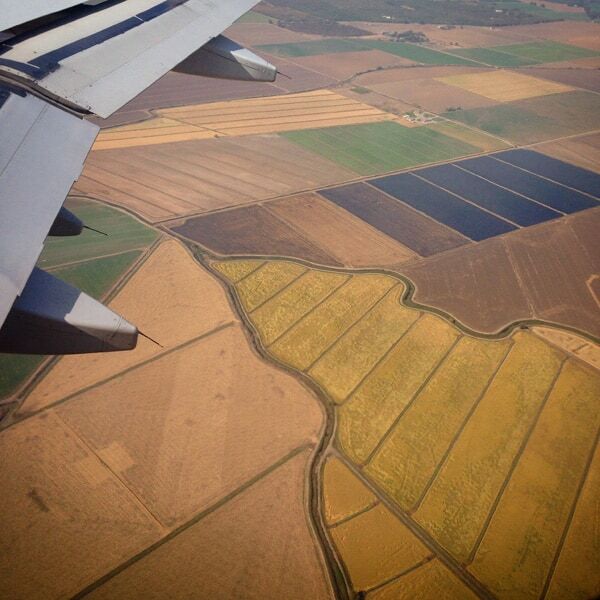 And this gorgeous quilt of agriculture, just east of Sacramento, had me staring in awe. 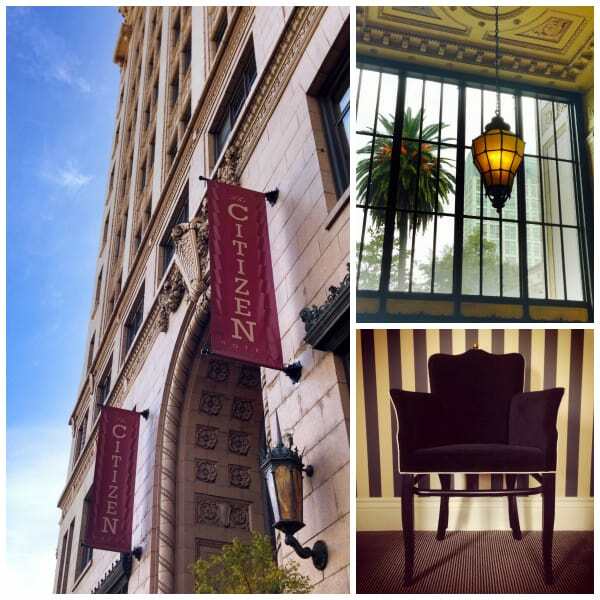 The Citizen Hotel was the perfect place to stay in Sacramento. Historic, with all the modern conveniences, it really was a special place. I especially liked my room, with walls striped in bold black and cream. Our group ventured north of Sacramento to California Olive Ranch, about a 90 minute drive. The area has been in desperate need of moisture and Mother Nature chose our field day to let down the rain. Which left us happy for the Sacramento Valley, but sad that we didn’t get to actually harvest olives. The harvest machines were shut down for the day. We walked the beautiful rolling orchards, grateful to learn about this company and its product, just the same. Harvesting olives in California dates back 300 years, when the Spanish brought over the first olive trees. 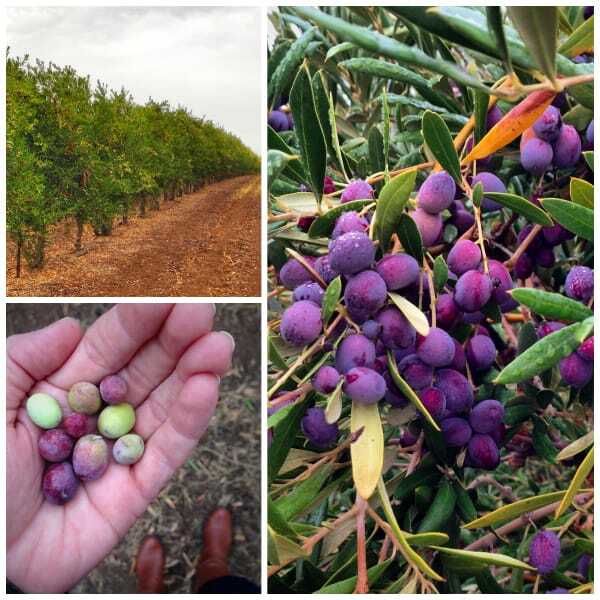 Raised more like a vineyard than an orchard, olives are a low maintenance crop, pollinated by the wind and able to thrive on low water consumption. Even though we didn’t get to see olives harvested from the orchard, we got up close to a harvester (photo: right). This machine can pick an olive tree clean in just 5 minutes, yielding about one finished bottle of olive oil. 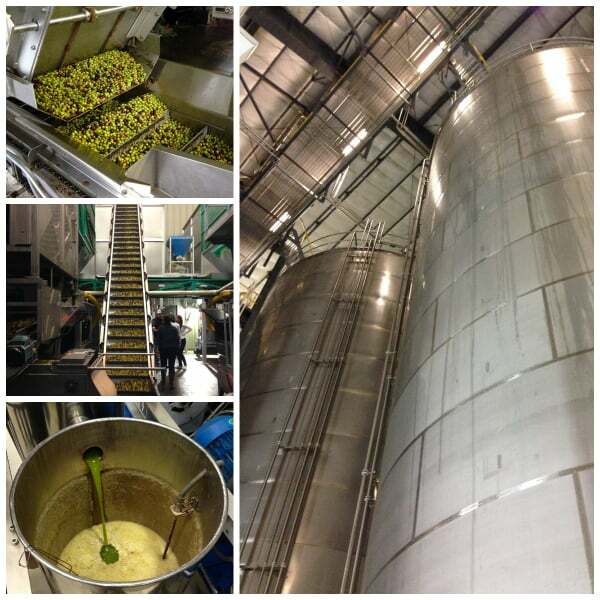 Once picked, the olives are transferred to a truck and then brought in for processing (photos: left), assuring the freshest olive oil possible from field to bottle in just 6 to 8 hours. Samples are taken from each truckload. These olives are graded for maturity and then ground, pit and all, to measure fat and moisture levels. Each step of the process tracks exactly which olive variety (California Olive Ranch grows three different varieties of olives) is being processed, the farm it came from, plus the date and time, for full traceability. Every bottle of oil from California Olive Ranch displays the date the olives were harvested. And nothing goes to waste. The olive leaves and the post-press mash is used for feed at nearby cattle ranches. California Olive Ranch prides itself in the superior quality of its extra-virgin olive oils. Where some companies mill and sell olive oils from two to four separate presses, California Olive Ranch does just one with a cold pressing process, yielding the highest quality olive oil for each and every bottle. The pressed olives produce a fabulous green colored oil that mellows out to a straw yellow hue over time (photo: lower left). Once pressed, the olive oil is stored in gigantic stainless steel temperature controlled tanks (photo: right), protecting the oil from its enemies of oxygen and light. Each olive oil variety is isolated to its own tank. Then as orders come in throughout the year, the oil is blended and sent out. We had the pleasure of sitting down with Bob Singletary, the very impassioned head miller at California Olive Ranch. He creates the olive oil varieties and tastes every single batch of olive oil pressed there. Bob taught us the basics of olive oil tasting, saying that extra virgin olive oils should never have heavy or greasy qualities, and that different types of olives make distinct types of olive oil. He showed us how to first identify the olive oil with our nose and then with our taste buds with a sip-slurp-swallow technique. We determined a variety of flavors, from grassy to pungent, to biting and bracing. When Bob and others are doing serious taste testing for quality control, these cobalt blue glasses are used so the tasters aren’t influenced by the color of the oils. 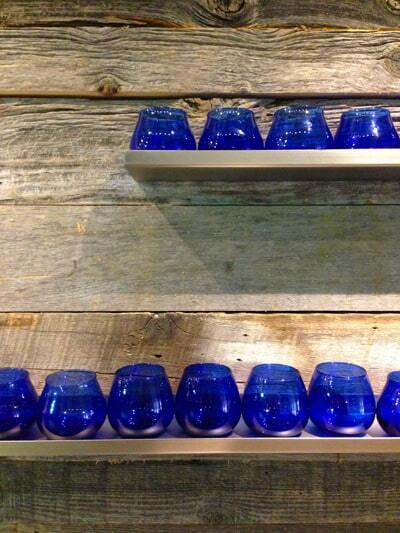 The glasses were just so pretty, lined up on shelves against worn wood walls, that I couldn’t resist the photo opp. Thank you so much to California Olive Ranch for inviting me to spend some time with you, to learn about your wonderful olive oils and your harvesting process. My travel and hotel expenses for my trip to Sacramento were paid for by California Olive Ranch. I was not compensated to write this post. All opinions are my own.